Much has been made of whether Vladimir Guerrero Jr. will begin the 2019 season in the Major Leagues. Turns out, he'll have the opportunity to compete against the game's best sooner rather than later. Baseball's top prospect will head to Major League Spring Training in a few weeks, the Blue Jays announced Saturday. Among the headliners with Guerrero is the Blue Jays' second-ranked prospect, Bo Bichette. Guerrero Jr. tore through Eastern League pitching with Double-A New Hampshire in 2018, posting a .402/.449/.671 slash line with 14 home runs and 60 RBIs over 61 games. But a hamstring injury he suffered in early June cost the 20-year-old nearly five weeks of playing time. He was promoted to Triple-A Buffalo for the first time on July 31. 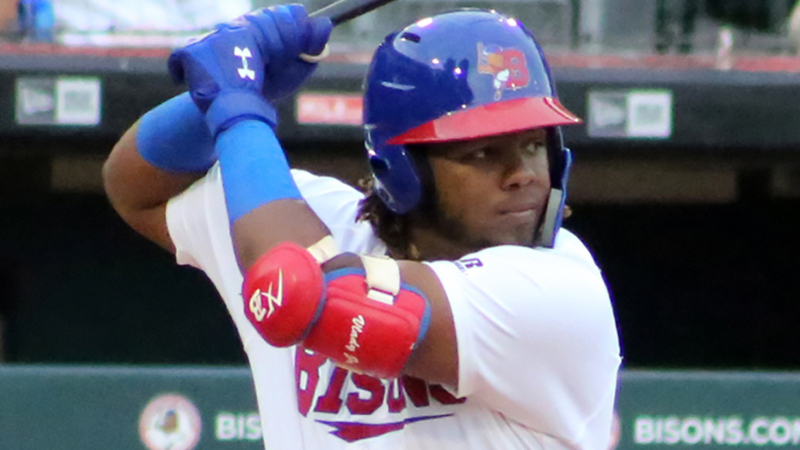 With the Bisons, Guerrero Jr. batted .336 with a .978 OPS. He slugged six homers and plated 16 runs in the International League. At the conclusion of the regular season, the Dominican Republic native continued to hone his game in the Arizona Fall League. There, he hit .351/.409/.442 in 19 games at third base for Surprise. Once again, his playing time was cut short; this time he departed five days before the season ended to tend to a family matter, but he didn't depart before being named an AFL All-Star. While there's little to doubt what Guerrero Jr. can accomplish with the bat, some questions marks existed regarding his defense and mobility. But the organization appears pleased with how he handles himself at the hot corner. "Yes, he had a standout year offensively, but what we're most excited about with Vlad is the progress he made on the defensive side of things," Blue Jays director of player development Gil Kim told MiLB.com last month. "First-step quickness and technical footwork were main areas of focus for him this year and he really improved on both of them." Bichette spent his entire 2018 season with the Fisher Cats and started 114 games at shortstop -- he played in 131 contests total -- for the club. MLB.com's No. 11 overall prospect produced a solid .286/.343/.453 slash line, although it did not match the video-game like numbers he displayed in 2017 between Class A Lansing and Class A Advanced Dunedin. He did maintain a consistent level of run production, though, driving in 74 runs both years. When the Blue Jays promoted Guerrero Jr., the 20-year-old felt he was not far behind. "I think that I'm ready to join him up there right now," he said at the time. "That's not up to me. Whatever the front office decides for me, I'm going to trust it. I'm just going to try and get better here and play as hard as I can. I don't think it gives me any extra motivation, I'm pretty self-motivated myself. I'm just going to try and do my thing and hopefully they promote me soon." Among the other non-roster invitees were ninth-ranked prospect Cavan Biggio, the son of Hall of Famer Craig Biggio, and No. 15 T.J. Zeuch. Biggio had a breakout campaign with New Hampshire. The 23-year-old slugged a career-high 26 homers and plated 99 runs, which was another career best. He also walked 100 times, and the combination of a good eye and hitting for power led to a .887 OPS. Outfielder and No. 25 prospect Forrest Wall; infielders Santiago Espinal and Eric Sogard; catchers Max Pentecost and Patrick Cantwell; and pitchers Javy Guerra, Zach Jackson, Willy Ortiz, Mark Leiter Jr., Shawn Morimando and Justin Shafer all snagged non-roster camp invites as well.